In a heads up game with RunBetter, I open from the button to 300 with . RunBetter calls. RunBetter checks and I decided to bet 200 into the 600 pot. I always like to bet 1/3, the sizing is great and works for all my bluffs and strong hands. It is also good for pot control. This flop is good for me as it’s rainbow and a dry board. RunBetter called and we take the turn which is a .
RunBetter checks again and here we can both be betting and checking. I decided to bet 700 into 1,000 because the board is full of low cards and the highest card is a . I can get three streets of value from a on the flop, turn, and river bet. However, the problem with betting is that I risk getting bluffed out of the hand by a good player. RunBetter decided to check-raise me to 2,200 and I called. 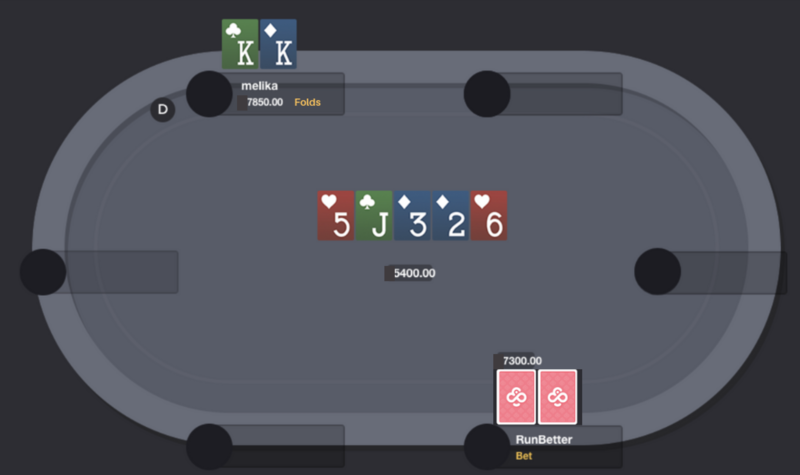 The river is a and RunBetter shoves all-in with 7,300 into 5,400. I decided to fold here because he must be representing , , , , or . He could also have a random 4x hand. It’s expensive to bluff catch against an overbet and I need to be right more often for it to work. JeSuisJP1963 opens from the button to 600 in a heads up game. I decided to 3bet with from the small blind. is a good hand heads up, and strong enough to 3bet with. JeSuisJP1963 called and the flop is . I can continue betting on any spades on the turn as I’m holding the and it’s a great blocker. JeSuisJP1963 called and the turn is a . Now I have a flush draw and a gutshot which gives me enough equity to bet again. I bet 5,600 into 8,000 which is around ¾ of the pot. My bet sizes always depend on how much we are playing effective stack, but I like to size up a bit on the turn. JeSuisJP1963 called and we go to the river which is a . Here I missed my draws and I don’t think I can win by checking. I like to carry on betting as I was representing a strong hand pre-flop by 3betting, betting on the flop and the turn. I’m representing a flush and even though the board has a pair I don’t mind betting again with my bluffs since he would have to fold an [X] and many two pairs. If he had the in his hand he will now have to fold as it’s not a great hand to call down on the river. I go all-in with 10,221 into 19,200. 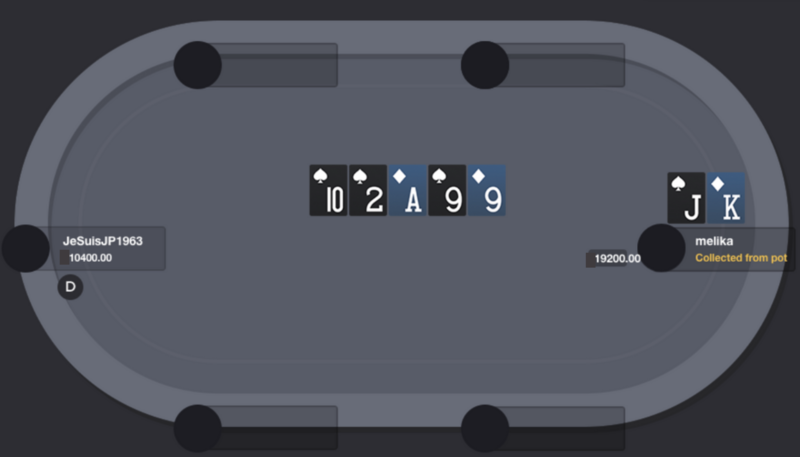 JeSuisJP1963 folds and my play and bluff landed me the pot. Previous Post Play for Nearly 2 Million GTD in 6 Hours this Sunday!